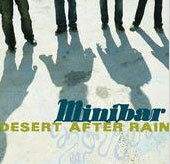 Minibar is one of those British groups that pay loving homage to America as the birthplace of rock, while actually believing that they and their countrymen can play it better. In order to prevent another round of squabbling about which nation has a better handle on the three-minute song, Minibar moved from London to Los Angeles two years ago. That's where the four-piece benefited from the Missouri-bred wisdom of producer T Bone Burnett (Counting Crows, Wallflowers, Elvis Costello) and made Road Movies, a terrific, country-tinged debut harmonized in distinctly English accents. The disc is explosive from the start, as the spare, plaintive intro of "Holiday from Myself" skips straight into the chorus--a full-bodied, smartly rolling set of lines that lead to gently picked guitar with a rimshot backbone. The coarse beauty of singer Simon Petty's voice is even more in evidence in "Choked Up," where his lament about "Running out of money at the end of the month...running out of money and time" registers with an honest simplicity that runs through most of the lyrics. By the third track, "I Know Without Asking," it's clear that Tim Walker, wielding electric and pedal-steel guitar, banjo and mandolin, has laid down a feast for guitar lovers: Everywhere, there are strings ringing with energy, delicacy, boldness and complexity. Meanwhile, bassist Sid Jordan and drummer Malcolm Cross push it all along with a steady sense of impatience. The band doesn't put a foot wrong through the entire album, keeping its hot streak alive through the floating air of "Sheer Volume of Traffic" and the achingly brief shimmer of "Cool Water." But the disc's spiritual center can be found in the hazy title track, where they breathe out the word California with tired awe, as if they had driven clear from England to L.A. just to make one masterful record. © 2001. All Rights Reserved. Time Out New York.